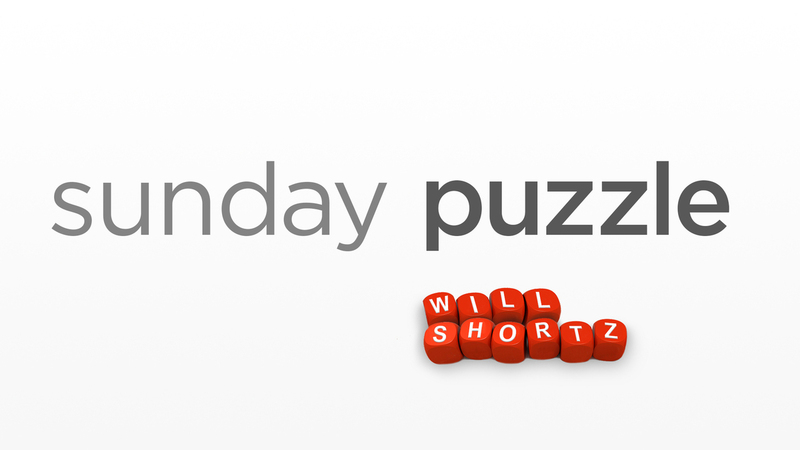 Sunday Puzzle: Find The Missing Link NPR's Lulu Garcia-Navarro and Weekend Edition Puzzlemaster Will Shortz play a word game with WRVO listener Dan Panachyda of Manlius, N.Y.
On-air challenge: I'm going to give you two words. Think of a word that can follow my first one and precede my second one, in each case to complete a familiar two-word phrase. The answer will rhyme with one of the two words. Last week's challenge: Take the 7-letter last name of a famous woman. Drop the letter E. Add an I and an F. You can rearrange the result to get a word that famously describes this woman. Who's the woman, and what's the word? Winner: Dan Panachyda, WRVO listener from Manlius, N.Y.
Next week's challenge: Take the 9 letters of BEER MOUTH. Arrange them in a 3x3 array so that the three lines Across, three lines Down, and both diagonals spell common 3-letter words. Can you do it? If you know the answer to next week's challenge, submit it here. Listeners who submit correct answers win a chance to play the on-air puzzle. Important: Include a phone number where we can reach you by Oct. 25 at 3 p.m. ET.